It's not uncommon for babies and small children to suffer from a dry and itchy scalp. With younger children who are starting out in the washing-their-own-hair-department they may not be rinsing out shampoos thoroughly enough, their body could be reacting from stress at school or they could be suffering from eczema or dandruff. To keep your child's scalp healthy it's best to use all natural hair products, particularly organic shampoo made with certified organic ingredients. These have less chemicals and synthetic elements in them than conventional products (even the mild varieties) that can irritate the more sensitive skin of children. 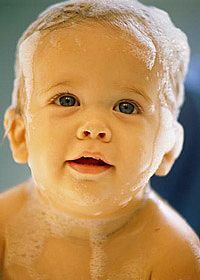 The main irritating ingredient in mainstream shampoo is SLS for babies. A couple of good natural and organic products for children with a dry scalp are Earth Friendly Kids Zingy Citrus shampoo and body wash, shampoo and conditioners from Green People's children's range and Lavera's Basis shampoo's and conditioners for sensitive scalps. Calendula oil is also very calming and can be massaged into the scalp for a soothing reprieve from any itchy frustrations. The soothing salve or repair lotion, both by Essential Care, are also good. Remember to patch test all products on your baby or child's skin before use in case they have unknown allergies to any of the ingredients, even the natural ones.